In Shattered Ramadi, A Weakened ISIS Fights On Behind Human Shields : Parallels Iraq recently celebrated a victory against the Islamic State in Ramadi, a city just 70 miles west of Baghdad. But NPR's Alice Fordham went there and found there's still heavy fighting. Iraqi security forces and allied Sunni tribal fighters evacuate an injured woman after she was shot by the Islamic State in Ramadi on Jan. 4. Iraqi forces have pushed ISIS out of much of Ramadi, but daily fighting is still taking place in the southeast part of the city, where ISIS is using civilians as human shields, according to the Iraqi military. American and Iraqi officials recently hailed a victory against the Islamic State in Ramadi, the capital of Anbar province that's just 70 miles west of Baghdad. ISIS had captured the city last May and retaking it was a top priority for the Iraqis. But despite Prime Minister Haider al-Abadi's visit to the city center, and Barwari's boasts, the extremists are still holed up in the southeast of Ramadi, and progress there is being slowed by the presence of thousands of civilians. "When ISIS retreated from other districts, they took civilians with them as human shields," says Barwari. He calls it a problem but says the "cleaning" operations are ongoing and tells his men to take us from this improvised base to see for ourselves. The road winds past buildings with caved-in roofs and crushed pillars. The small cinder block houses have holes blasted through the walls, which allowed ISIS fighters to run from house to house as they fought to defend the city. A pedestrian bridge, painted pink, is a collapsed heap. Humvees are crumpled masses of metal. No one is living here. Deeper in, it becomes clear fighting is still intense. Helicopters buzz overhead every few minutes, laying down covering fire. Frequent explosions rattle the windows of the empty houses. The soldiers say these bangs are airstrikes carried out by the U.S.-led coalition. "We are, inshallah, going to move into the Sofia area," Sgt. Maj. Raed Mohammad tells me, standing in a street littered with shell casings and gesturing to the southeast. But, "in this area, we are using different tactics, because there are so many civilians." Iraqi civilians are loaded onto a truck Thursday to be taken to safety amid ongoing fighting between the Iraqi security forces and the Islamic State in Ramadi, 70 miles west of Baghdad. More than two weeks after central Ramadi was declared liberated, Iraqi forces are still battling pockets of ISIS militants on the edge of the city. 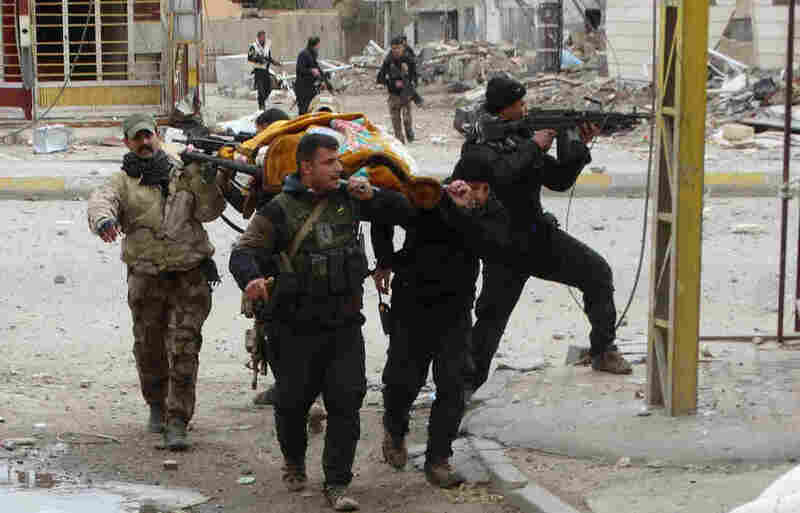 Earlier in the Ramadi battle, the Iraqi security forces and their allies, backed by coalition airstrikes, were able to push relatively fast into largely depopulated streets. Now, the front line is relatively static. On one side of a city street are Iraqi forces; on the other is ISIS, with an estimated 1,000 families they've dragged along with them as they've withdrawn into this holdout. If the soldiers push into the area, they risk accidentally killing civilians. And if those civilians rush toward the Iraqi troops, they could become easy targets for ISIS. "We're trying to rescue them," Mohammad says. Every day, hundreds of civilians brave ISIS fire to come running across the front line, some waving white flags. Many die in the attempt, or are injured. Outside one of the city's biggest mosques, there are an ambulance, stretchers and soldiers. The sound of weeping rises up above the din of aircraft and explosions. Four children, all about age 5, are lying on the stretchers. Counterterrorism forces are hastily applying iodine and bandages to their wounds. "We came from Sofia," a sobbing little boy tells a soldier. "But another family came with us and they were hit by ISIS." A 16-year-old who gives her name only as Jinan says the militants told her "they'd shoot anyone who tried to leave." Today an airstrike hit near the house where they were sheltering — which is how the children were injured — but in the ensuing confusion, they seized the chance to flee. The soldiers tell us they take fleeing civilians to an improvised base on the southern edge of the city. They give medical aid, food and water and take the men away for questioning to see if they're involved with ISIS. The women and children are gathered in another requisitioned house, a squat, gray building with the sound of weeping floating out of the broken windows. "We ran away at dawn," Hashima Khalil tells me. She's 55 and ran 2 miles, barefoot. She can hardly stand up now. "We've been drinking rainwater," she says. Conditions in the city worsened during the seven months ISIS was in control, as security forces severed supply lines. Water, food and electricity have been cut off for three months. "We were moved from place to place," she says. 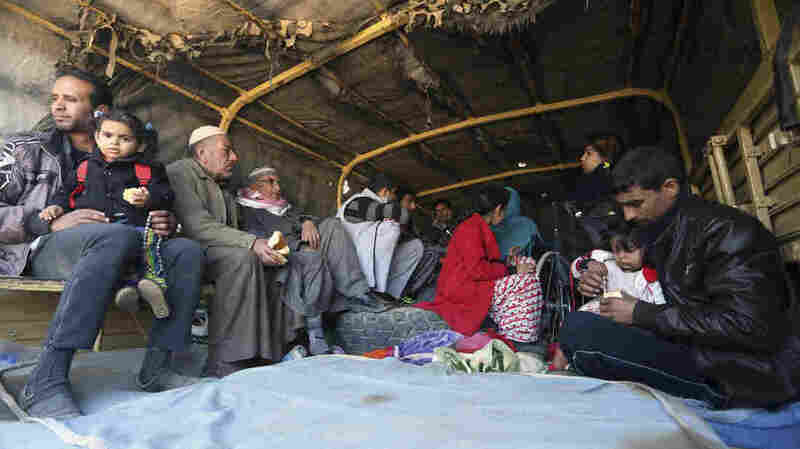 The extremists forced families to move with them as they withdrew gradually in the face of ongoing assaults by the Iraqi military. They threatened to blow up the houses of civilians who didn't comply, with the families inside. Nearby, Barwari is on a rooftop, overseeing the detonation of roadside bombs and booby traps left by ISIS. A walkie-talkie on the table next to him blasts the radio message of the militants. The operation, he says gloomily, is not going well. "Right now, we can't go inside Sofia," he says. "We worry that if they see us coming, they will rush to us and be hit." Another officer says the operations will continue, but more slowly than they had hoped. Although victory is not complete, most of Ramadi is now held by Iraqi security forces, and U.S. and Iraqi officials are already talking about pushing ISIS out of other cities. Those cities, too, are crowded with civilians. The slow battle in Ramadi and the toll on its people seem likely to be replicated as the fight against ISIS in urban areas carries on in the months — and maybe years — ahead.